For years I’ve had issues with my wrists to the point where even curling something as light as 15lbs felt like a challenge. You can imagine the fears I had whenever I held focus mitts for people especially if it was something small like micro mitts. That’s where the Ring To Cage Deluxe Curved punch mitts came in though. For starters the padding is very firm as it uses a dense core. It’s not something you can hit with small MMA gloves for various rounds. The plus side to that though is that the holder’s hands feel almost no shock whatsoever. Even a kick landing with the heel wouldn’t go through the padding too well. Very protective for the holder but the puncher would need some good Boxing gloves. The wrist is also supported very well due to a cushion being right under the palm. Due to the wide nature of the mitts though sometimes it is possible to land at the edges and twist your wrist a bit but unless the puncher has awful aim, this isn’t much of an issue. I have noticed that with certain punches, sometimes hooks, my fingers do get jammed but again this isn’t a constant issue and I haven’t gotten some drastic injury. One of the main issues these mitts have is comfort. For starters there is half a ball to grip onto which is great but the ball is a little too big for someone with small hands like me. Again though, not a huge deal. The real problem lies where the finger holes are. They’re very awkward, so awkward that I thought I got two left or two right mitts. 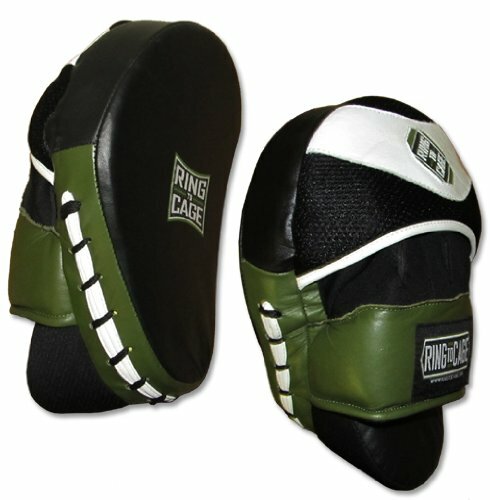 I had to get confirmation from Ring to Cage that they don’t have designated left or right mitts. I think that’s where the problem lies though, sure you can slip anyone of them on and not care but that sacrifices comfort because they’re built to be ambidextrous. The pinky feels like its stretching farther than it has to in both mitts no matter which one I’m using. I specifically bought these Deluxe Curved mitts for the wrist cushion. I figured this would add the support that I was looking for and it has. It’s comfortable, the cushion doesn’t get in the way. I wish it was a tad softer though so your wrist sunk into it better but it works and that’s all I wanted. Definitely top notch job by Ring to Cage. The leather is a very good quality and the padding shows no signs of wear. I have no issues in my pair not even in some of the more delicate sections like the mesh, just some loose stitching in one mitt but nothing that has caused anything to open up. Through and through these things are tanks and the punishment they can absorb is unreal. They are gear that’ll be with me for years to come. Great job by R2C for sure and in my opinion some of their best work. The design is what sold me on these mitts. As I mentioned, that wrist cushion is what I wanted to try out. It definitely gives me the support I was looking for. The half ball to grip onto is also a great addition and the curved style of the mitts conforms to the hands. The design does have its flaws though. Some small like the wrist cushion being slightly too firm. Then there are much larger mistakes like not having a designated right and left mitt. A softer cushion, designated mitts, and larger more rounded call, these are things that would help make these mitts almost perfect. Also a wrist wrap to tighten up and hold the mitts in place would be excellent as sometimes my grip loosens up and the mitts can pop off with a good punch. The size is more of a preference thing in my opinion. They are wide mitts that’s for sure. As I mentioned a hit on the edge will cause them to twist your wrist. Many people view big mitts as a problem because for one it’s a large target which makes it too easy and two they’re too large to practice, “speed.” The Deluxe Curved mitts are advertised to weigh 12oz but both came in heavier at 13.8oz and 13.9oz. Even so, I can whip these things around faster than some can punch so I don’t believe in that whole micro mitts for speed and big mitts for power. These Curved Mitts work for both things when I use them. As a side note, the size can also help to train with knees, elbows, and even kicks. While they are big you need to remember that the only support you have is your wrist and a wrist is not strong enough to take a full force knee or kick. Unlike a Thai pad these don’t have the forearm to offer support. 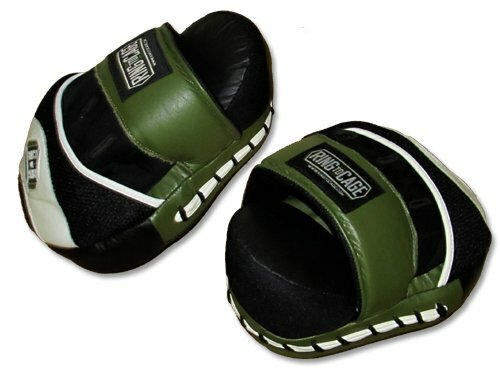 I recommend throwing light kicks or knees, practicing form with these mitts when it comes to those strikes is ideal. 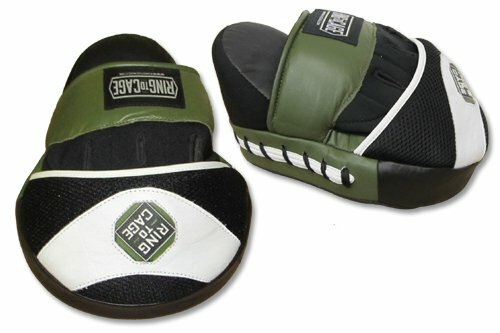 With punches on the other hand, as I mentioned these can absorb punches like tanks. These go for around $90 (at the time of this review) and for that price I think it’s a little too high. I’ve seen them go for $60 and that’s more fair. Even though I praise them I don’t exactly feel right paying $90 for mitts when I’m only $10 off from having enough for some C17s. Again that’s just me, the good part is that you won’t have to get these once a year. You buy them once and they’ll last you several years. These are great mitts for someone who needs additional wrist support. Great mitts for someone wanting to have as much protection as possible for their hands. Job well done once again by Ring to Cage. 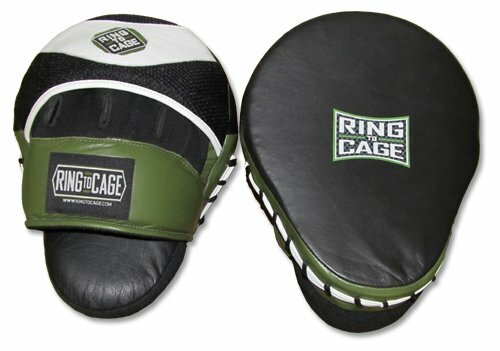 Lobo purchased this pair of Ring to Cage mitts himself for the full price. This did not influence the outcome of this review.